Following our mini-hiatus week, we have a lot of material, despite the small break in production. We have a particularly large amount of fan art to share. Even if they aren’t working, some production folks KEEP WORKING! We appreciate when they share their insights and experiences with us. An advantage of keeping track of the production crew (and writers) is that we have a chance to meet some of the huge amount of folks responsible for bringing the show to life. The Expanse Production Office shared more of the behind-the-scenes magic as they showed where background effort is performed prior to filming a scene. This covers processes such as hair and make-up, and wardrobe. This particular day, there were one hundred background performers, and clearly the crew treats those with as much care! As they mention, just one of the unnoticed moving parts! Some astute fans noticed this filming (see below under Community, Fan Location Pictures). Chris Danelon shared this Anubis concept art from Season 1 by North Front Studios. Jeremy Benning (Director of Photography) shared this image of the process of dialing in a new lighting cue. 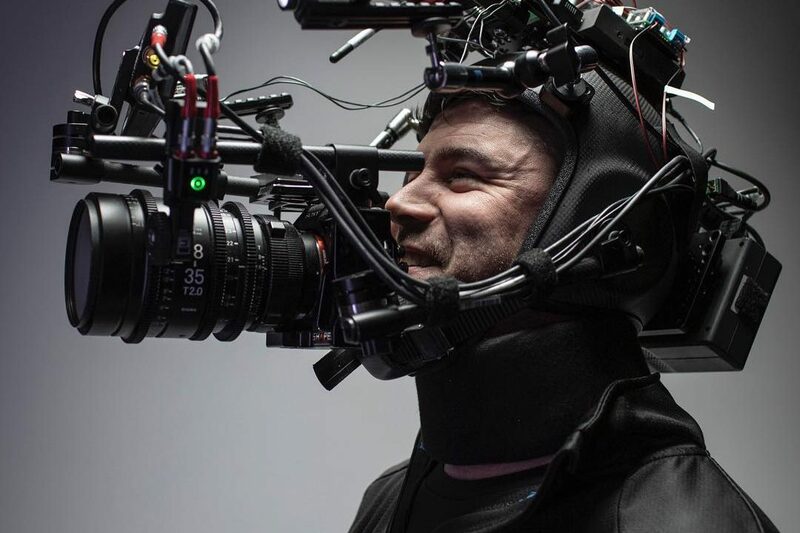 He also showed off a new first-person camera rig, which will be used in a “breaching sequence” in Season 4. VFX Jenn shared a terrific photo of behind the scenes of what it looks like on set (the outside of the set). If you check this out, you’ll see a comment by Greg Boutin, who is involved in set construction. He loves his work! A lot of equipment is necessary in TV productions. This is especially true for The Expanse. Wired connections make using cameras and other equipment challenging. KITPLUS (@tvbay) recently got the chance to catch up with Jeremy Benning of the @csc_CDN to talk about his experience using the #BoxxAtom system (a wireless enabling system) on The Expanse. The Writer’s Room got a little love from @42NerdtasticPl with cool Expanse-themed candles. Check these babies out. The cast & crew keeps busy both during production and hiatus, juggling schedules. Cas Anvar shared his experience at the Golden Globes. We share his hope that The Expanse gets a nomination (or maybe more than one) for Season 4! We like to keep track of other cast efforts, too. Cas Anvar is in Room, now on Netflix in Canada. Check it out to see Brie Larson’s Oscar-winning performance as a mother who was kidnapped as a teenager. If you saw obscure references to #AAS233 this last week, it’s because the American Astronomical Society held its 233rd meeting. During the meeting, lucky attendees got to see Cas Anvar and Cara Gee in The Habitable Zone Goldilocks Paradox series on the Hyperwall (display). You can catch the webisodes online. Our favorite Martian marine Frankie Adams (Bobbie Draper) appeared on the Feelings for Breakfast podcast. What’s Your Story Vancouver sat down with Cara Gee to talk about The Expanse and her new films, Red Rover and Trouble in the Garden. Finally, Cas Anvar had a special message for fans in the new year! We have some news on Green Ronin’s The Expanse Role Playing Game, and an upcoming expansion kit for Wizkids’ The Expanse boardgame. Green Ronin provides some insight into the game development, as well. The Expanse game developer Steve Kenson has prepared a series of articles, all about the Expanse RPG. This article focuses on character development. You can also anticipate an expansion titled The Expanse: Doors and Corners Expansion for Wizkids’ already avaliable The Expanse themed boardgame. Vice had some very nice things to say about The Expanse in an article titled “The Best Thing on TV This Year Was ‘The Expanse’“. We certainly agree! Vice also spoke with our favourite co-authors Daniel Abraham and Ty Frank in a series of videos under the title “How Sci-Fi Has Changed Your Life, Even If You Don’t Realise It“. io9 continued heaping praise on the show as well, listing it as one of their best TV shows of 2018. Meanwhile, Rotten Tomatoes‘ TV Features Editor Debbie Day had some very nice things to say while listing The Expanse in RT’s “13 Shows You Should Binge-Watch Right Now“. The Expanse also made it into the category featuring the top TV-shows in “Apple presents the best of 2018“. People took advantage of time off and some completed or neared completion of long-term projects. We have a lot to share with you. But, we want to draw your attention to an exceptionally funny video prepared by fan Yanheda. Her fan video “Crack 2” will have you in stitches. And of course don’t forget to check out the January edition of Here Comes the Juice. Twitter fan Tracie Ching shared her portrait of Amos Burton played by Wes Chatham. Instagram fan “Partial Volume” does a Portrait-a-day-January Space Edition! Days 4-6 featured Alex Kamal and Camina Drummer (Cas Anvar and Cara Gee). Twitter fan Jim W. Coleman continues his The Expanse art series with Alex Kamal by Cas Anvar. Reddit fan /u/Heavenly Eros drew this “ray of f’n sunshine” (Avasarala played by Shohreh Agdashloo). Reddit fan /u/Incomprehensile drew this clever little montage. Hope to see more of this work. Here’s a nice portrait of Josephus Miller (Thomas Jane) by Instagram artist ElJotEm. Instagram fan ArtlessAsylum created a minimalist vac suit portrait. Reddit fan /u/gunslinger2217 is nearly done with his collage of Expanse favorite characters. This one has taken the artist 15 hours, so far! Instagram artist fan Johanterwage shares his Detective Miller portrait. Instagram fan Mary_blackbird15 created a glowing Julie Mao (Florence Faivre). The Reddit Reading Group has an interesting discussion regarding the vastness of space (covering Leviathan Wakes Chapters 0-13). Mollie Bee’s The Expanse Season 1 Episode 2, Episode 3, and Episode 4 Review and Reaction! Here is a new podcast from @Rogue_Two, @Andy3E and @EltonMcManus discussing The Expanse S1. The May We Geek Again podcast also shared their take on the first half of Season 3 in three installments. Here is a cool 3-D printed Roci. Martian pride on the car! Twitter fan @KarlsWeb continues to work on his UX for his Belter costume. Fans even customize their combat simulators. Mike Fleming chose the MCRN look for his aircraft. Alan E Baker shared his stunning b3d model of the MCRN Donnager. Reddit user /u/steelow_g also shared his render of the Razorback. Paine x MacTane shared Fan Cocktail 69: UNN Agatha King. This cocktail is named after the Jupiter fleet flagship that Admiral Souther respected, despite her electrical problems, when reassigned there after his departure from the Joint Chiefs. They also released two special cocktails dedicated to the Screaming Firehawks family and the Rocinante family!! The first episode of unofficial fan-made Expanse miniseries Verso Ex was released, check it out! Bora A Kutlu also welcomes you to The Expanse Metro – Route 2019, a follow up to his video The Expanse is All Around Us that he shared during the cancellation. Alert Reddit members shared that they noticed The Expanse was filming at Roy Thompson Hall, the location set for the UN building. That’s it for the first edition of The Expanse Week in Review for 2019! We hope that people were able to take time to rest and rejuvenate and be with friends and family.